Sonic is offering 50¢ Corn Dogs ALL DAY today May 24th to celebrate the end of the school year! 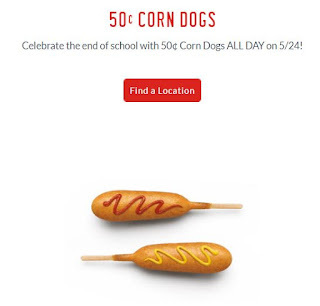 Sonic will be offering 50¢ Corn Dogs on Thursday, February 8th. Tax not included. Offer valid only on February 8, 2018, at participating SONIC® Drive-In locations while supplies last. Not good in conjunction with combos or any other offers. Treat the kids out for dinner. Enjoy family night out for less with a $1 Kids Meal offer. Just use this coupon to get this special offer now through Sunday (2/4). Today, 1/31, is the day to get your FREE Valentine’s Doughnut from Krispy Kreme! 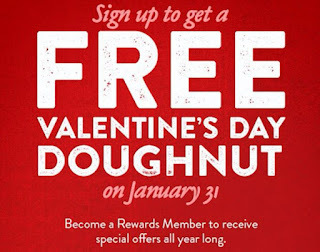 Krispy Kreme Rewards members will earn a FREE Valentine’s Doughnut on January 31st. If you’re not a member sign up HERE. Offer valid 1/31/18 for Rewards members at participating U.S. Krispy Kreme shops only and is subject to product availability (which may vary by market). Offer valid for one-time use. Limit one free Valentine’s Day Doughnut per Rewards member. Not valid with any other offer or coupon. 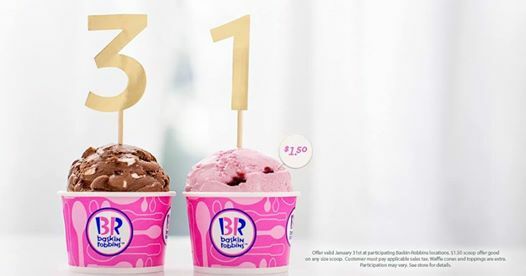 Heads up…this Wedesday, 1/31 is Baskin-Robbins $1.50 scoop day. Every 31st they run this promo. YUM! Starting tomorrow, November 9th and running through November 13th, Starbucks will have their annual Buy 1 Holiday Drink and Get 1 Holiday Drink FREE from 2PM-5PM at participating locations. Chick-fil-A Cow Appreciation Day (7/11) – Get a FREE Entree For Any Customer w/ Cow Attire Until 7pm! 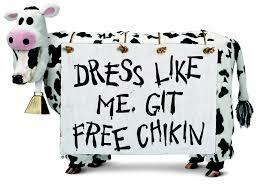 Chick-fil-A will award customers dressed in cow attire a FREE breakfast, lunch or dinner entrée (excludes salads) from opening until 7PM on Tuesday, July 11th! Cow attire includes items like a cow-spotted scarf, purse, hat or other accessory. Kids can also score a FREE Kid’s meal for dressing in cow attire! Prime Day Gift Card Deals – Gap, Outback, Panera & More! Prime Day starts at 6pm and here are the Prime Exclusive Gift Card Deals you’ll want to keep an eye on! Times listed are in Pacific Standard Time.